27-Jul-2002 -- We are visiting the Maya region of Quintana Roo because our daugthers (Rita is Maria Rosa's daughter and Montserrat Lydia's and mine) with their friends Carlo and Irene are working at the Marine Turtle Protection Programe in Akumal. Looking at the map I saw an opportunity to visit this confluence that seemed somewhat easy since roads get you there to within seven kilometers. This was the easy part, and quite interesting since we where the only vehicle in most of these roads into very small villages with very kind people. Once we stopped our car at Yodzonot Chico the GPS indicated just under 7 kilometers. We talked with the locals and got on our way. 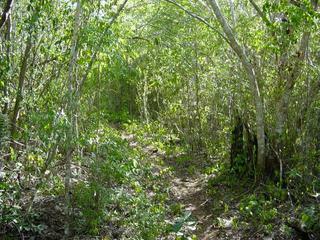 The first two kilometers where very nice in the middle of a jungle like terrain, very hot and very humid. Then, we reached a cornfield with no way out. After some consideration we concluded that we could not cover the distance at our pace specially once the trail ended. SO we started our way back. But we took a minute longer to make this decision because a group of bees started attacking us ... we ran as fast as we could for somo 300 meters. Three of us escpaed unharmed but the others ended with no less than 20 stings. For what I saw, this is a doable confluence if you plan the whole day to reach it ... and very nice one if you accomplish it.